While this response may help people feel better about themselves, it certainly won’t make them smarter. Because the reality is: Buffett has spent most of his time reading and thinking since he was in grade school. Having more money or managing a large company doesn’t magically give you free time. Having free time is never the default. People don’t just fall into huge blocks of free time unless they retire. Rather, free time is the result of strategy. It’s the result of looking at time differently. Curious about Buffett’s unique strategies, I’ve read several books about him, read most of his annual letters to stockholders, and watched nearly all of his interviews. And make no mistake about it… behind Buffett’s jovial demeanor is the most stone-cold, ruthless prioritizer (in a good way) in the world. Below are the top six strategies Warren Buffett has used throughout his career in order to have lots of reading and thinking time. I invite you to copy them so you can have more time to do what’s most important to you everyday. As you read these strategies, be aware that these aren’t just random strategies that are thrown together like the typical listicle you see online. There’s a deeper pattern that most people miss — his #1 mental model. He never talks to analysts (Buffet estimates that 20% of the typical public CEO’s time is spent talking to Wall Street). He rarely talks to the media. He doesn’t attend industry events. He has lived outside of NYC in Omaha, Nebraska for almost his entire career. He barely attends any internal meetings like typical CEOs. What’s important to see here is that these decisions don’t happen by accident. They require continually resisting immense social pressure. First, Buffett had Flint write down his top 25 goals on a piece of paper.Go ahead and write your goals down now. Next, he had him circle the top 5. So far, nothing special. The real threats to our time are not obvious distractions that we know are wrong.Rather, the real threats are the wolves in sheep’s clothing — activities which make us feel like we’re working hard, but that do not ultimately move the needle. Buffett’s three-step approach inoculates against these! The real challenge to prioritization is saying, “No!” It’s easy to say yes. What’s hard is saying no to busy work that gives you the satisfaction of checking an item off your to do list — meeting an obligation to someone else, doing an easy task, writing an email. Similar to how Buffett audits his work activities, he also audits who he works with. Buffett ONLY works with CEOs he trusts, who get results, and who he can see himself working with for decades. As a result, he does incredibly little negotiation and due diligence before he buys a company, and doesn’t actively manage the CEOs of the business he owns. Furthermore, he enjoys the conversations he has with the CEOs. Buffett applies the same criteria to the people on his team — many of them have been with him for decades. Buffett’s personal life is also very simple. He lives in a modest home (the same one he has been in for 60 years), and he only spends $100,000 per year personally. As we grow in our careers, in our companies, and in our lives, it’s extremely easy to add complexity. In fact, it’s the norm. As you get more profit, it’s normal to hire more employees. As you earn more money, it’s normal to spend more and more. What’s truly powerful and unique is to keep things simple. That takes effort and skill. And, that is part of Buffett’s genius. It’s odd to say this, but one of the world’s richest people may also be one of its biggest minimalists when you compare the lifestyle he could live to the one he chooses to live. Warren Buffett only makes a handful of investments per year. Buffett holds his bets for extraordinarily long periods. Buffett is not alone in thinking long-term. One would think that the greatest investor of all time (the GOAT if you will) stays on top of the latest technologies in order to stay up-to-date. Buffett is very clear on what data he needs to know in order to make an investment. He is confident enough in his thinking that he is willing to NOT do what is popular . proactively removes potential distractions from his environment rather than depending on willpower. Now, you understand. Warren Buffett’s free time to read and think isn’t just a fluke. He’s designed his life for it. And these aren’t random strategies… They are all derived from a critical mental model — the 80/20 Rule — the fact that 20% of efforts cause 80% of the results across many areas of our life. In each domain of his life — relationships, investments, technologies, priorities — Buffett is a master at ruthlessly prioritizing the few things that matter and cutting out everything else. So, now the question is: how do you actually consistently and masterfully apply the 80/20 Rule to your life. While Buffett’s 3-step process is extremely helpful on a theoretical level, I’ve also found it lacking on a practical level. It misses a lot of the nuance that can derail the plans of us mere mortals. For example, simple putting something on an “avoid-at-all-cost” list is not enough. It takes work and skill to avoid these tasks in my experience. In addition, prioritization takes time, which means you need to make it a new habit, and creating consistent habits take hard work and skill. Determine your true values. When you prioritize without having clear values, your goals often end up feeling empty. Without your own north star, the goals you set are often the result of the values of the cultures you have previously been in. Therefore, your goals aren’t truly your goals. I first learned about value setting in Value-Focused Thinking: A Path to Creative Decision-making. Determine your true goals. Without setting clear goals, your daily priorities become overwhelmed with urgent tasks that have a short-term payoff that make you feel good. Having clear values-based goals keep you focused on what matters short-term and long-term. Set aside time for prioritization. I recommend setting aside the following blocks in your calendar as a bare minimum: 15 minutes daily, 1 hour weekly, 3 hours quarterly, 1 day yearly. Make a list of everything you have to do. Getting it out of your head and onto paper is cathartic, and it gives you the fodder for the rest of the steps. I learned the power of this step from David Allen’s Getting Things Done. 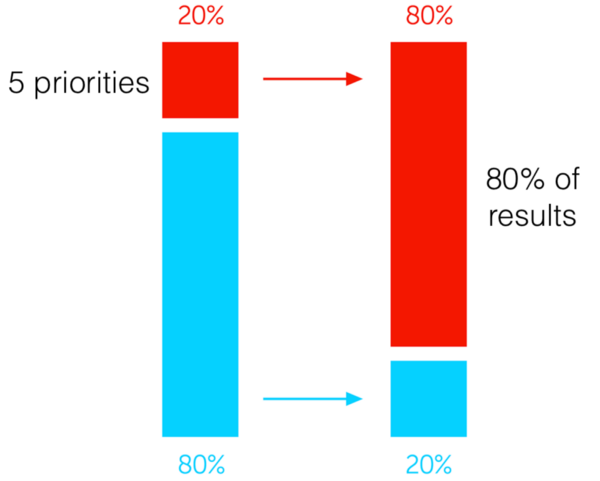 Circle the top 20% of priorities that will give 80% of the results. This is where you separate the wheat from the chaff. It’s where you rise above information overwhelm and get perspective on what really matters and can move the needle. Practice the 80/20 Rule like you would any other skill. Applying the 80/20 Rule doesn’t just mean asking yourself, “What’s most important?” and then moving on. Prioritization is a skill. By learning and then using different mental models such as the bottleneck analysis, ICE method, or the critical path approach, you get different ways of seeing your priorities. Every time you set your priorities is an opportunity to practice becoming better at prioritization. Identify the single most important priority. The 80/20 Rule is fractal. Meaning that within each 80/20 there is another 80/20. So, if you narrow down a list of 25 priorities to five priorities, you can then apply the 80/20 Rule again to focus on the one priority that gives you 80% of the results of the five priorities. I learned the power of narrowing down priorities another level via The One Thing. Do your “one thing” first. When our day starts, we have the most energy and the least distractions. This makes it the perfect time to tackle the hardest, most important activity. If you leave your one thing for later in the day, it will probably not get done on that day. I learned about managing my days based on my energy levels in The Power Of Full Engagement. Collect and measure metrics primarily on your “one thing.” The mind loves metrics, especially public metrics. This is why social media platforms can so effectively train us to maximize our followers, likes, and comments. When these vanity metrics increase, we feel like we’re making progress and doing important work. But, at the end of the day, if you run a business, what matters more is tracking profit first. If you run a non-profit, what matters more is improving the world. If you are trying to reduce loneliness, what matters more is how many high quality interactions you have with close friends. My business changed overnight when I took the time to identify the few metrics that really mattered and then focused religiously on them. Once you do this, your mind automatically and subconsciously thinks about maximizing these important metrics rather than vanity ones. Put everything else on your “avoid-at-all-cost” list. Just as Buffett suggests you do. Create a pre-mortem for your “avoid-at-all-cost” list. Here’s the key… the reality is that it takes a ton of energy and discipline not to do certain items on your “avoid-at-all-cost” list. If you are not deliberate, you will likely fall into old habits. To make sure this doesn’t happen, I recommend doing a pre-mortem. With a pre-mortem, you envision your day and ask yourself, “Let’s assume I fall into old habits and get distracted. What was the cause?” By being aware of potential distractions before they happen, we drastically increase the odds of avoiding them. Practice saying no. Similar to how applying the 80/20 Rule is a skill, so too is saying no. The skill is recognizing areas where we should say no, but don’t and then devising a solution for each situation that actually works. Get both accountability and coaching. In my experience, I often resist the things that are most important, because they require me to confront my fears and self-sabotaging beliefs. Therefore, I always operate more effectively when I share my priorities with others every day and every week, and when a coach forces me to be brutally honest with myself and gives expert feedback. Accountability helps me put my foot on the accelerator. Coaching helps me remove my other foot from the brake. Each of these steps is absolutely critical. Miss one of them and your ability to pick and follow through on the right priorities plummets. We all have 24 hours in a day. Therefore, “hustling” harder can only get us so far. Focus is one of the 20% of skills that give us 80% of results in our life. It allows us to accomplish in one year what might take someone else a decade. Furthermore, by focusing on the few things that matter at work, we get back time in our personal life to be healthy and spend time with loved ones. But remember this: To get the full benefits of focus, we need to look at it as difficult skill that takes years of practice to develop. Focusing sounds simple, but it requires huge emotional and cognitive resources to follow through on consistently. This is why everyone touts the power of focus, but few people actually truly focus. 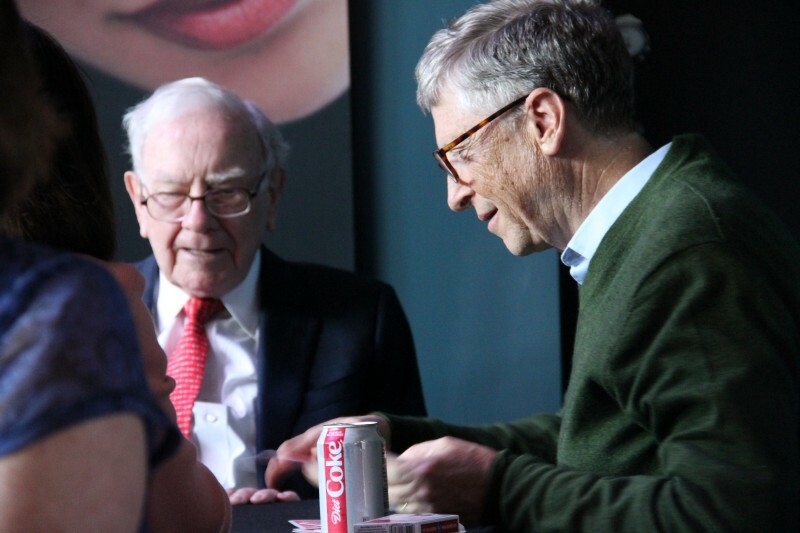 Warren Buffett’s strategies inspire us all to be one of the few who do. Disclaimer: Keep in mind that I came upon the story of Buffett’s pilot through a chain of people I trust, and it has been written about in several top publications. At the same time, I take it with a grain of salt. Thank you to a commenter below who shared this article, I’m not sure if it happened at all, in part, or not at all. Either way, the advice is sound and has had a big impact on my life.